Once your recipients receive your mailer, they simple fold and tear off the sides to expose the form inside. They can even use a return stub already attached to the document (depending on your form used). 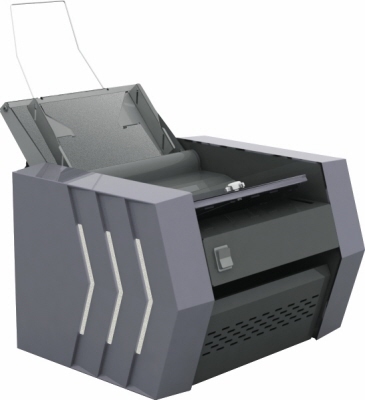 These Mailing Machines eliminate the need to fold and stuff envelopes - which eliminates your labor cost associated with mail and marketing production. Stock paper forms are designed for a variety of uses and can be printed in any laser or ink-jet printer in house - then run through the sealing equipment in one step. You can even print your own address and mailing account information on the single or double sided forms with or with-out a duplex printer. The Pressure Seal Forms are designed and pre-treated on the sides to be sealed by the machine with-out having to handle your stock once printed. The forms are available from OREweb.ca® in various different fold and design formats in letter (8 1/2" x 11") and legal (8 1/2" x 14"). Please contact us for more details or to find the right solution to fit your specific mailing needs. The Ideal-MBM ES2000 is an excellent entry level desktop pressure seal machine for low volume production mailing tasks. The ES 2000 folds 2,200 sheets per hour of printed form stock and can handle both letter and legal sizes. Designed for desktop folding and sealing applications, this folder will allow for quiet operation with easy set-up and maintenance. Paper formats accepted 6" x 8" to 9 1/4" x 14"
Machine dimensions 15" x 13" x 11"
The Ideal-MBM ES5000 is a desk or table top unit designed for entry level to mid-volume pressure seal applications and mailing tasks. 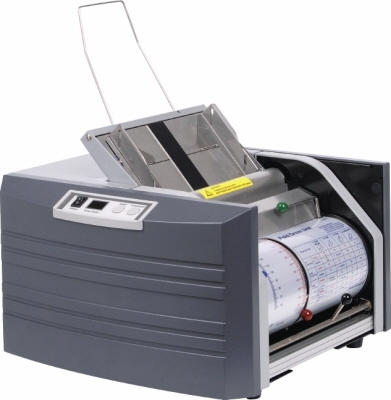 The ES 5000 folds 4,250 sheets per hour and can run batches of pre-printed forms in both letter and legal sizes. This pressure sealer folding and sealing machine offers a manual bypass test slot for processing of pre-folded forms. This equipment also offers some advanced features such as an anti-jam system, preset fold features and the folding unit slides out for quick and easy maintenance. Machine dimensions 16" x 17" x 10"